The more I teach the more I view estimation as an intricate part of my students learning math. – students, mostly my grade 9 applied students were better at problems like “how many tiles will be needed to cover the floor?” (I mention grade 9 applied because they were not very good at these types traditionally). It’s also not just a simple estimation that Estimation180 has them do…..it’s the act of giving an estimate that is too high and too low. These extra estimations give students an upper bound and lower bound for their answer. They are boxing in a range on what the right answer can be. That process has been great when we extend into problem solving. Students are much better at judging the reasonableness of their answers. They are automatically doing the “look back” step and saying “that answer is too high”. From now on every problem we do is going to use the too high, too low method. Estimating has to occur every time! For the last two years I have been using whiteboards in my class. 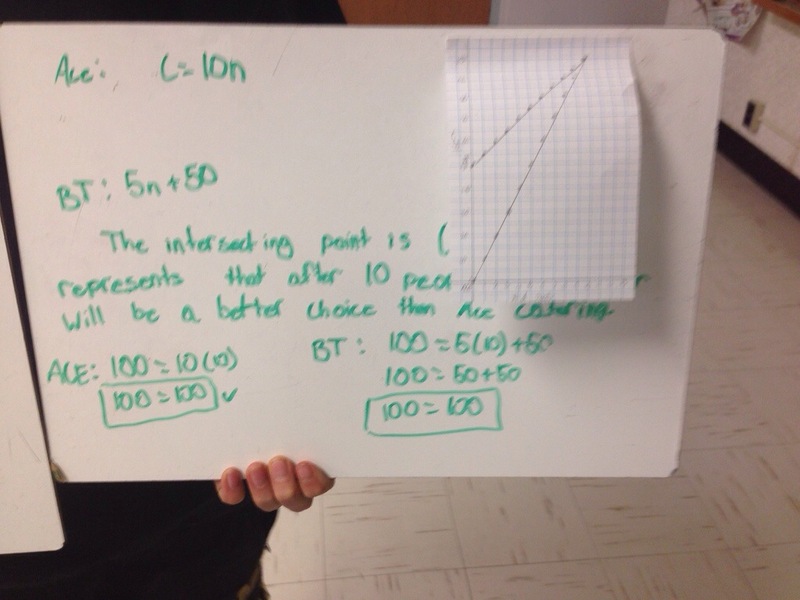 Whiteboards are now our go-to way to show and do math. My students are attempting way more problems and asking for way more feedback than in the past. I think this happens because the students think that if they write work on the board it’s not permanent. While if they write in their notes, well, it’s stuck in there. They are hesitant to write on paper if they could be wrong. It’s permanent then! They are more likely to “try” to do some math and risk being wrong on a whiteboard! It can wipe away if wrong. It’s Ok! Using whiteboards are like estimating! It’s ok to make mistakes!!! I think if my students have to use paper I’m going to say …”No Erasers! !l” just go with it! Try something! Great blog. We have a motto….’Real mathematicians use pen!’ There is still a place for pencils….However, teaching students that their mistakes are an important part of the learning process allows them to take those risks! Thanks jenn, like the motto…Pens!